Southern Sandstone is littered with small and often ignored outcrops. More often than not they are on private land and or have climbing bands due to SSSI or other restrictions. Some are often too soft to climb and are overgrown. Occasionally some micro venues pop back into the limelight when connoisseur sandstoners seek them out. 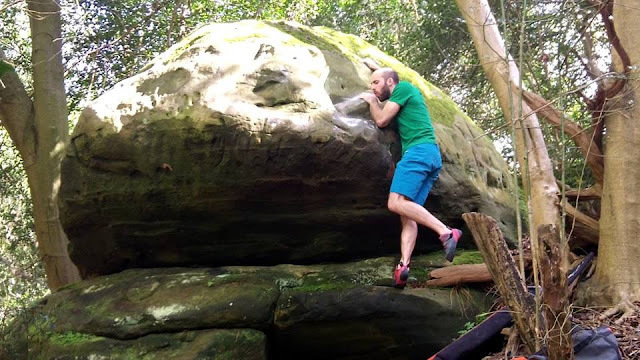 Tom Gore enjoys seeking out those hidden problems on more secluded sandstone outcrops, as such Tom recently opened up a few more additional problems at Lampool Farm Rocks. Currently, access does not seem to be an issue and little is known of who the owners are. Tom reports on his recent development there. "Lampool Farm Rocks is a small crag south of Crowborough. It's located in a valley with small outcrops situated on both sides. There is only one boulder that is of real interest to climbers - about 4 metres in height and not overgrown." "The easiest climb up the slabby (and shady) side of the boulder that I have dubbed 'Stepping into the Light' as this is what it feels like when you are top out." "The main rounded overhanging face of the boulder with good, but well-spaced holds. Currently the best problem at the crag!" "The right side of the wall goes at about f6B+. This looks a lot easier than it actually is and required a very high heel hook. Hence the name - Hips Don't Lie." "If you are climbing on the Southern Sandstone crags often, then this little outcrop might be worth a quick hit." Tom Gore is an active Southern Sandstone climber based in the south east of england, primarily focusing on bouldering. He has done numerous first ascents and repeats of some of sandstones hardest lines. Tom is sponsored by Beyond Hope Climbing. Also, see Tom's article on Secluded Southern Sandstone over on UKC.